'The Record Holder' A4 No 4468 'Mallard' in the Up Yard on 7th September 2013. Being a ‘Granthamian’ born and bred it’s always nice to see something special going on in the town, especially when it has a railway orientated theme. For many decades, along with its engineering heritage, the railway has formed a very important part of Grantham’s cultural history. During the early part of 2013 it became apparent that some sort of celebration was being organised to mark the 75th anniversary of the world speed record for steam locomotives being set on Stoke Bank just south of our town. 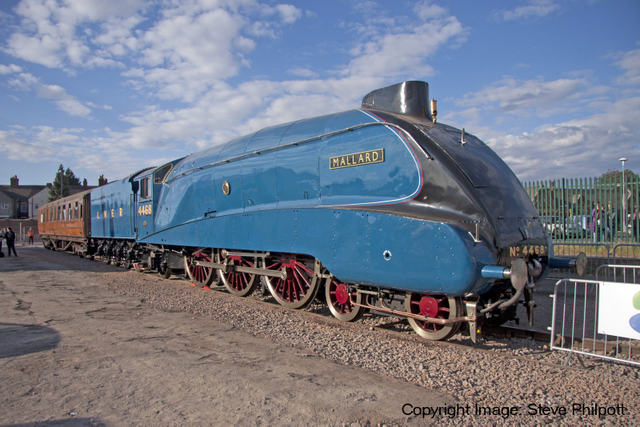 As the year progressed more details about this event were made public and it emerged that an attempt was being made by the organising committee to bring and exhibit Sir Nigel Gresley’s A4 Pacific 4468 ‘Mallard’ to the town. Of course, as most people know, this locomotive is the holder of that world speed record. Unfortunately, due to all sorts of logistical reasons it wasn’t going to be possible to hold the event on the exact date of the record run, 3rd July 1938, so a weekend in early September was chosen which was near enough! As mentioned previously, Grantham had for over a century been an important location on the East Coast Main line as a locomotive depot for the L.N.E.R. and latterly B.R. in steam days; because many services changed engines here. However, as dieselisation progressed throughout the late 1950s and early 60s Grantham’s importance diminished quite rapidly until it was no longer required following the implementation of full diesel hauled passenger services in 1962/ 1963. This also heralded the subsequent closure of the motive power depot in early September 1963. 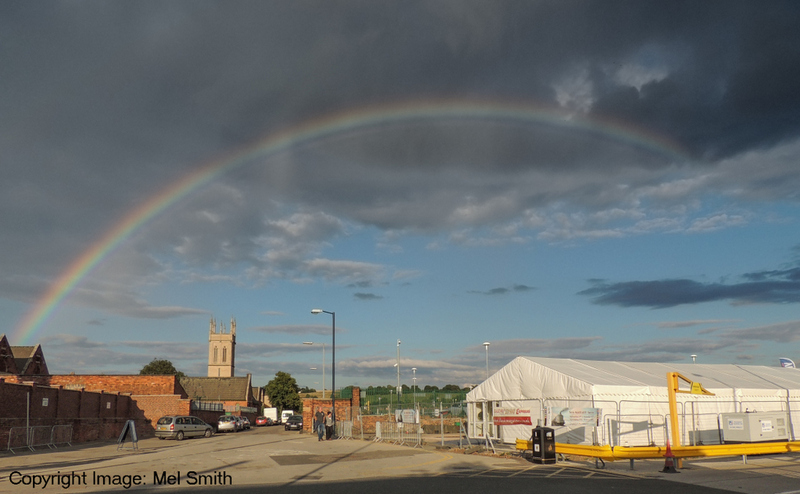 It’s ironic that the sad 50th anniversary of the closure of Grantham’s motive power depot coincided with the weekend chosen for the ‘Mallard’ event that had been arranged for September 7th and 8th 2013. The decline in Grantham’s railway importance continued throughout the 1960s and 1970s. An example was the iron ore traffic that passed through the town between Colsterworth, High Dyke, Barnetby and Scunthorpe Steelworks. When this ceased it was the end of the line for many of the train crew jobs locally. Services and more importantly resources were rationalised to suit the ever changing and diminishing local requirements. Ultimately, these changes led to the eventual closure of the remaining train crew depot. Staff either left the railway completely or transferred to other depots, such as Peterborough, Boston, or Lincoln, or took up other positions within the service. So, after decades of negativity it was wonderful to see Grantham’s rich railway heritage being celebrated once more with the town’s museum, local businesses and the council all getting together to move the project along. The only real stumbling block was whether the National Railway Museum would actually permit ‘Mallard’ to leave the confines of The Great Hall at York and travel to Grantham. Historically for many decades they had never really allowed one of their star attractions to be out of their sight, with a lot of people (including me) not being really too optimistic about 4468 actually getting here! As a fore-runner to this planned weekend the inhabitants of the town had already been treated to an exhibition of photographs taken by Cedric Clayson, John Clayson’s father. Cedric Clayson was a master photographer of both locomotives and staff going about their work during his many visits to Grantham station in the late 1950s and early 1960s. In fact, one of the portrait shots Mr Clayson took was of my maternal grandmother, May Ross, who was one of the duty station announcers at the time. As the weeks went by in the run up to the planned ‘Mallard’ event, work was carried out by Carillion to restore the trackwork in the old up goods yard. This area was between what is now the south car park and the retaining wall / fence running adjacent to the east side of the old yard. Further work was also undertaken to restore the rail connection onto the main network again and allow the exhibits to be positioned once they’d arrived. With only a few weeks to go it was confirmed that ‘Mallard’ would definitely be coming and as far as I know this was down to one individual, Mr Henry Cleary, chairman of what was known as the ‘Mallard Grantham Partnership’ He apparently would just not take “no” for an answer! Fantastic! By the time of the preceding week everything, as far as the infrastructure issues were concerned, appeared to be ready. On Wednesday 4th September 2013 a special locomotive movement hauled by DCR class 56 loco No 56311 headed south from the N.R.M. with 4468 and 55019 in the consist. The formation finally arrived at Grantham during the late afternoon. Unfortunately on that day I was unable to be there to see the arrival due to the fact that I was in Germany on a railway-orientated visit which had been planned many weeks before. The weekend of the event was rapidly approaching. We now had ’Mallard’ our star exhibit in situ, complete with it’s ultimate and worthy successor, an English Electric Type 5 ‘Deltic’, namely 55019 (D9019) ‘Royal Highland Fusilier’ which was kindly loaned by her owners, The Deltic Preservation Society. Once all of the locomotives and the other exhibit, a Gresley third class buffet coach, No.641, had been positioned, it was all systems go! 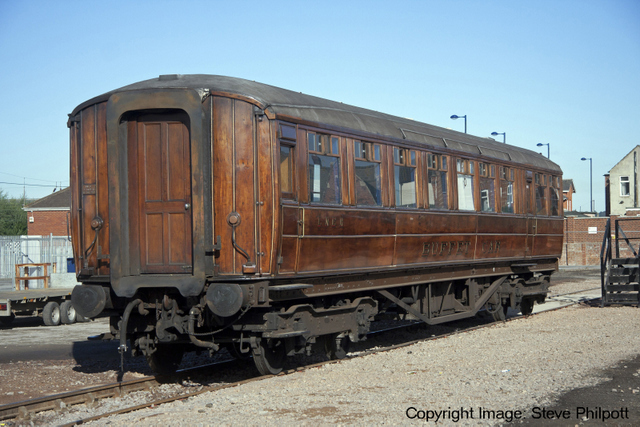 The coach had been delivered by road due to its delicate nature and the fact that it would have been restricted to running at a very low speed on the main rail network. That would have been totally impractical, plus I doubt whether Network Rail would have allowed it anyway! LNER buffet car no 641 in the Up Yard at Grantham on 7th September 2013. During the course of Thursday and Friday fencing was erected and stalls and stands arrived with everything taking shape around the venue during the ensuing 48 or so hours. Finally everything was ready for the start of proceedings on Saturday morning. The calm after the storm. Everything is now ready for the big event. The weather forecast was good and I’d already managed get various shots of the exhibits on the Thursday evening from the reverse side of the fence using my step ladder. Myself and a few others were very kindly allowed access to the locomotives for photographic purposes an hour or so before the event started by the GNER staff and Station Manager, Simon Pashley, on the Saturday morning. The sun was out and the weather was playing ball and people started to arrive. The stalls had all opened up and there were a number of vintage sports cars and motor cycles being exhibited as well. An added attraction was a food hall and a film venue for everyone to visit. The whole Mallard event was free with no charges being made for entry to the site. Another event taking place and running parallel to this over the weekend was the Grantham Railway Society’s excellent annual model rail show. This was held as usual at the Walton Girl’s School on Kitty Briggs Lane, just off Harlaxton Road. The model rail show was served by a number of vintage buses operating between the two venues, so both events served to complement the other which was fabulous! I spent Saturday meeting up with old friends and acquaintances over the course of the day. 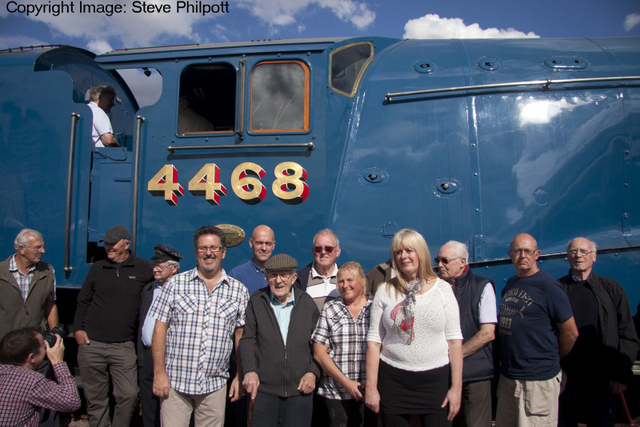 A number of us managed to get a few group shots of all the surviving steam locomotive men and their families posing in front of ‘Mallard’ as a memento. On the Sunday I took up more ‘formal’ duties as a volunteer steward. This of course meant keeping the public safe, informing them about what was going on and assisting in people moving in the right direction as well as marshalling the buses around! Grantham steam locomen & families with No 4468 on 7th September 2013. The whole weekend was a fantastic tribute to all those people who had put so much into the planning and implementation of this event. The footfall numbers bore testament to that, as it had been mooted in the local press that the organisers had hoped for a turnout of about 3,000 to 3,500 people over the course of the weekend. This was as often is the case totally wide of the mark! A final estimation showed that the figure was approaching the 15,000 mark, with people coming from all over the U.K. and beyond! Late on Sunday afternoon after the event had closed and most people had dispersed, a few of us were once again allowed access to the locomotives for a few more shots. The early evening sun provided us with ideal light, which was nice. The locomotives were to be returned north on the following day, Monday 9th September 2013. In view of this I turned up fairly early and met my good friend and Driver, David Court, to record the various shunt movements out of the exhibition area. Another locomotive, Brush Type 2 (class 31) No 31190 had arrived and this was to be the train locomotive for the journey back north. Once again, I had been granted access to the siding and was able to get some good shots, helped again by the good weather. 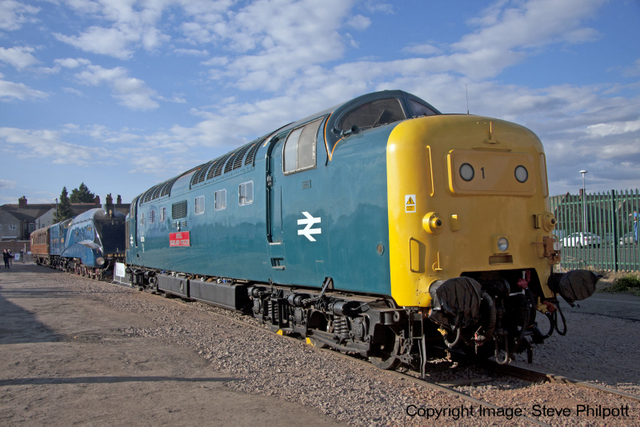 Deltic No 55019 'Royal Highland Fusilier' with A4 No 4468 'Mallard' behind, in Grantham Up Yard on 7th September 2013. 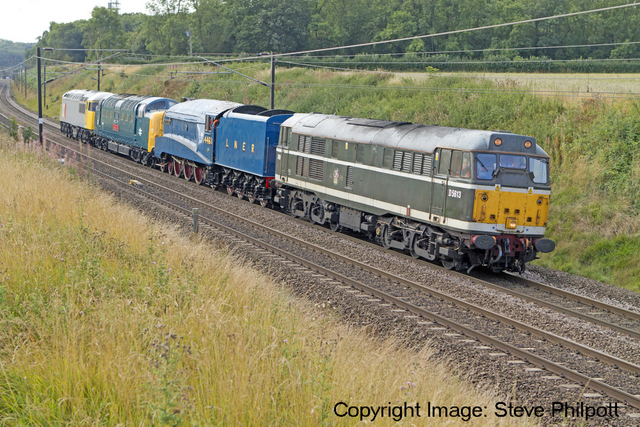 The class 56 (56311) was started up and Deltic; 55019 'Royal Highland Fusilier and the A4 4468 ‘Mallard’ coupled together, then attached to 56311. Subsequently the 56 drew them both out into the up yard. After this manoeuvre was completed 31190 was also attached to the north end of the formation with a brake test being performed ready for departure. No 31190, 4468, 55019, 56311 (5Z76) heading north past Barkston South Junction on 9th September 2013. Once this had all taken place I made a hasty exit for Barkston South Junction to photograph the ensemble on their journey to York. Once they’d passed me there I got in the car and photographed them again at Bessacar Junction, on the ‘Joint Line’ near Doncaster. 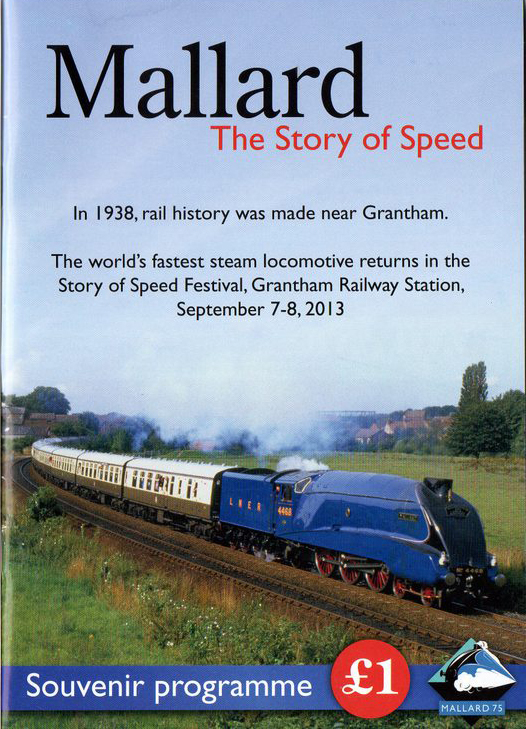 The souvenir programme for the Grantham Mallard Event. To conclude…..what a weekend! I was quoted in the Grantham Journal as saying that I thought it had been, in my opinion, the best thing to happen in Grantham for thirty-odd years! Some 4 years on and I’ll stand by that statement. Can we have another one soon, please?